Over the weekend Edie McGinnis (designer and our editor from the Kansas City Star) and I went to Spring Green, WI to stay in Country Sampler's "2nd. Story." (Click on the name and you can see where we stayed.) We cooked 5 recipes and photographed them for Blackbird Design's next quilt book which is due out this spring. After we unloaded all of our gear, large snowflakes began to cover the streets and walks. I don't think I've seen such a lovely snowfall in a long time. Just glad we were not still driving! The 2nd Story is within 1 block from the General Store, Grocery Store, library, post office, hardware store, the department store and of course Country Sampler. I even walked to the grocery store in my house slippers to get butter. I think I might have to move here....everything is so convienent. At home I have to drive about 6 miles to get close to a grocery store. After all of the cooking....we had to go shopping of course. What fun we had. We even had a chance to work on quilts. When I returned some lovely images were sent via e-mail to me and I wanted to share them with you. I wanted to share my finished hooked rug that I took from your “Cold Wind” quilt book. My daughter saw it and told me, “Thanks Mom for my Christmas present”, so that’s where my rug will go. Carol...love your rug. It looks so vintage! I've been silently gathering all the materials to make boxes for some of my stitching friends for Christmas. This week I began the exodus to completion. I have not been able to stop!!! So much fun! I don't know how I've ever lived without PVA glue! That "stuff" is simply fabulous...my mind has just been spinning with endless possibilities! I just took all my fat quarters to the copy store and had fun copying. Both times at the copy store, I've had comments from other creative women...wanting to know what the heck I was copying fabric for...then I just had to tell them! Your ideas make me look really good! Thanks for so many fun ideas you have given us on your blog! 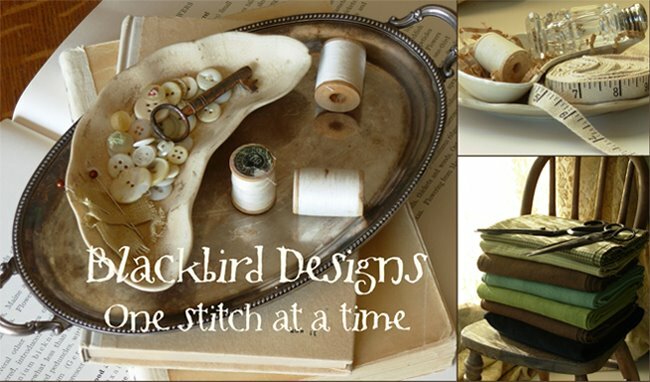 Cathy ....your stitching friends will loved these....hope they don't read this blog or your secret will be out! 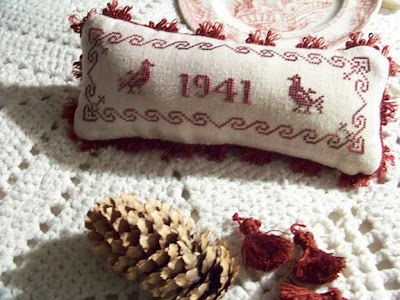 This was made by Mary Kathryn....you have to visit her blog for the rest of her pictures and the story that goes along with her project! Click on her name. Mary Kathryn....love the trim you used....where did you find this? I know we all will want some too. I love all the projects from your fans. I saw Cathy's blog and was amazed at how many boxes she made -- she's really going at it! I've stayed in a couple of rented houses now that were so convenient, just walk down the street and there's the grocery or the shops or whatever. I agree -- it certainly is handy! And of course it helps to be in a pretty location as well. One jar of the PVA glue would make lots of boxes. I don't have the exact number because I haven't just made boxes with the glue. I use the glue for fabric, paper and even when gluing paper to wood. I'm envious, Alma, that you were able to return to Country Sampler in Spring Green so soon. Looking forward to seeing the pictures you took. Thanks for the eye candy, Alma!! What gorgeous pics by creative women, inspired by two talented women. Love it! Another lovely inspirations post. Your trip to Spring Green sounded wonderful, makes me homesick for the mid-west. Love the rug and boxes. My small group is making covered boxes tomorrow - I'll send photos. 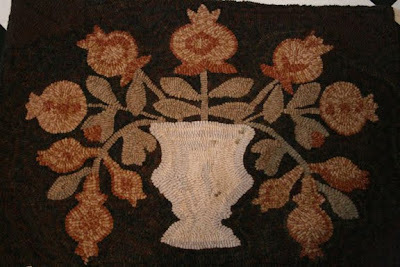 Love the hooked rug! I have the fabric to do the quilt, but now I can choose which block to use to hook a matching rug! Can Modge Podge be used to make the fabric boxes? Since I'm in Germany, I don't know where to get the PVA glue.